When it comes time to upgrade your workplace with an office fit out, there’s no reason why you should be left completely out of pocket. Whilst it’s important to invest in a professional office fit out, there’s no need to blow your budget to get your dream working environment. You may think that the only way to save money is by scaling back your project, in fact, there are many ways to lower the cost without cutting corners. High quality doesn’t necessarily have to be expensive. Here is our guide to saving money on commercial fitouts in Perth. Less infrastructure, less money. An open plan layout requires far less building works than typical cellular layouts, and less building works equate to lower costs. This clever initiative will not only reduce the price tag but also create a modern, collaborative environment that allows ideas to flourish. An unobstructed environment boosts the culture of your company and increases productivity. Use low-level partitions that are versatile if areas still need to be sectioned off. Try not to make any large changes mid-way through the project. Time taken to think of everything beforehand is time saved in the long term. Any big changes that aren’t included in the original plan will come at a price, so it’s a good idea to consider want you want the outcome to be. Planning for changes in the future and the growth of your business early, will save money down the track so factor this into the original design. Utilize your existing space. Don’t make changes to the layout that are not necessary. There’s no need to alter an area of your floor plan if it’s already working well. Not everything has to be adapted, especially if it fits with the new plan. Design your new layout to fit with what you’ve already got to minimize cost and effort. There is plenty of information on various trends and innovative ideas that you can draw on when creating your office fit out design. There are many modern ergonomic furniture solutions that can be utilized to maximize the available space. Spend time researching all the options before embarking on your project and you’ll find there is something out there to help every business. This extra knowledge will allow you to make informed decisions on what’s best for your project. Many businesses looking to save money will try to take on the project themselves. Unfortunately, this can often end up costing much more. A professional office fit out company can manage the budget, timeline, avoid costly mistakes, and removing the stress for the company. 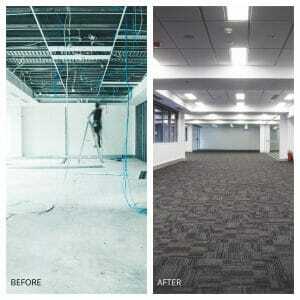 An experienced company such as Office Fitout Professionals handles all sized commercial fitouts in Perth. Hiring a fit out company also removes the need to hire multiple contractors to complete different jobs as a fit out company can take care of it all.